Is anyone swaging .358 projectiles from .223 cases? I ask this because I'm trimming the cases at the 1 to 1.1" length and don't know the case thickness may or may not be a problem with open tip projectiles, with out reaming the cases, since I don't have the dies as of yet to experiment with. Bill I mainly use 9 mm cases. I can use cut off .223 also. Just have not seen the need yet. What do you want to know? End case length after swagging? My 358 dies were designed for use in a tubular magazine so I can produce hollow point or flat point rifle bullets. I do not mind producing a few to give you some specks if that is what you are looking for. If your set is being designed with the rifle style tip 4s/6s the weight will be a little less than my style of tip. The length should be similar though. 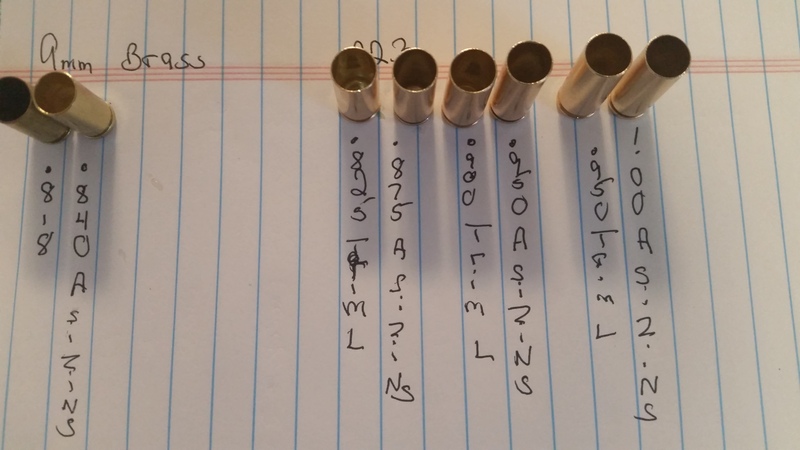 This is my current bullets ou9 of 9mm brass. Last edited by Time Killer; 02-08-2019 at 12:31 AM. 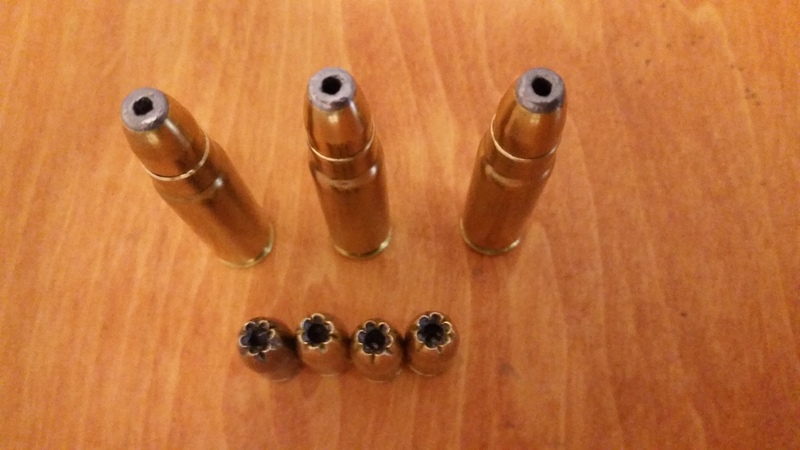 Thanks, great looking bullets, I don't think 9 mm will get me the length I need for the .357 AR, I don't really know. I don't want to go too heavy for the pistol. I'm thinking 185 grain should get me where I need to be. All I've loaded were target revolvers, either 158 plunkers or 185 for bowling pins. This wild catting AR's is a new world to me. Bill I will get you some measurements tonight when I get home from work. 9mm brass works perfect for 180 - 200 gr bullets. The bullets in the picture are 180 gr hollow points. Those are sitting in 358 Yeti brass. Here are some pics and sizes. On the right is a brass reduced in a jacket reducing die and a 9mm case to show the difference in length. I have some lead tip Speer 180's. They measure .86 +/-, so it looks like 9 mm may fit the ticket. I get a little concerned about feeding with lead, however there are those using cast but they are a lot a lot stronger alloy than the pure exposed tips. 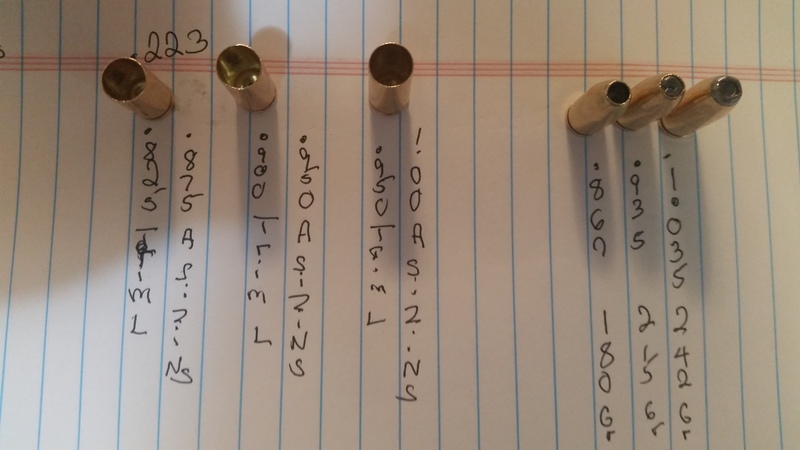 The other thing I went overboard buying brass and have more brass than I can use the rest of my life, especially .223, .308 and 30-06 Berdan and box primer. Yep I wrote that one down wrong. I rechecked it. It should be .86 not .66. The 223 brass will work great cut off also. 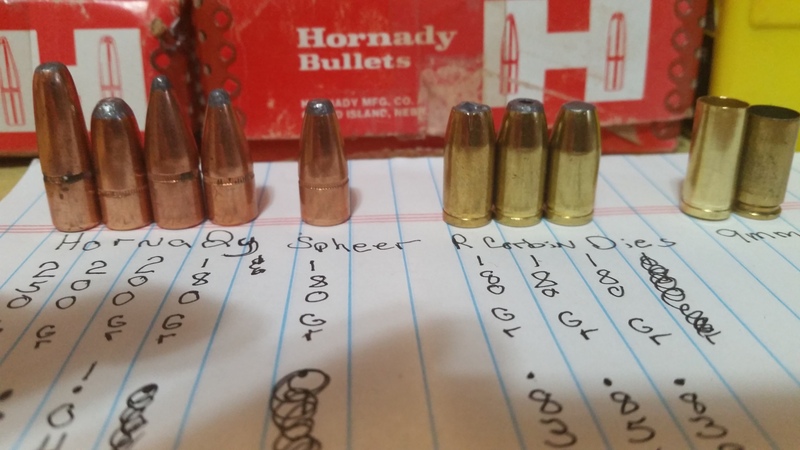 I am thinking if you are getting dies with the tip a little more closed than mine that you may want something with the length of the 180 -200 hornady bullet. May be I will get a few minutes to play with the 223 brass tomorrow. 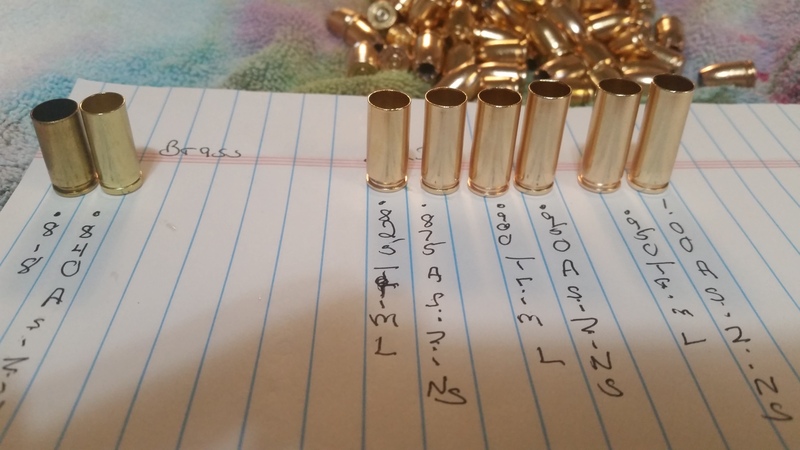 I've been using 9mm brass to make 200g pills for a .400 cal. and several different weights from 150g-180g in .308. My only gripe is the weight variance of 9mm cases can be really BIG. But I still think it si the way for me to go with my pistol calibers. Bill I had a little time to mess with this today. It looks like the .223 brass when run thru my 358 Jacket Maker Gaines approximately .050 in length. The first one is a 9mm then a 9mm when run thru my 358 Jacket Maker. These make perfect 180 gr bullets in my dies. As a side note I hot core my bullets and this gives me a little more room for lead in the case. I think some of it when hot cored goes down in the primer pocket. 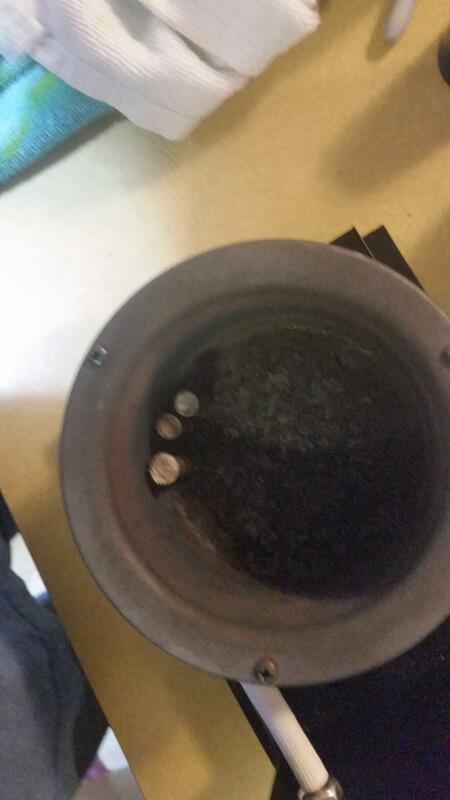 (Hot core Method) = Lyman Bid Dipper pot that has never seen lead. Place cores in the jacket and stand them in the pot. Cover the top with tin foil or some other method to help keep the heat in. Turn it on high and melt the lead in the jackets. Nun2Kute you are right mixed 9mm brass and .223 brass vary greatly in weight. I have found it best to sort by head stamp. This keeps the variances closer. I also use #9 bird shot to keep my weights close. If you do not have any it is cheaper to buy a box of bird shot and remove the shot from a few of the shells. It goes a long way and a 25# bag of shot has gotten a little high for me. Luckily I still have several bags of shot I purchased in the 80s. Last edited by Time Killer; 02-10-2019 at 04:59 PM. Pic to show hot core method. Second pic to show them after melted. You will notice the 3rd bullet has overflow of lead. I was trying for a 250 Gr and it would not hold the lead. 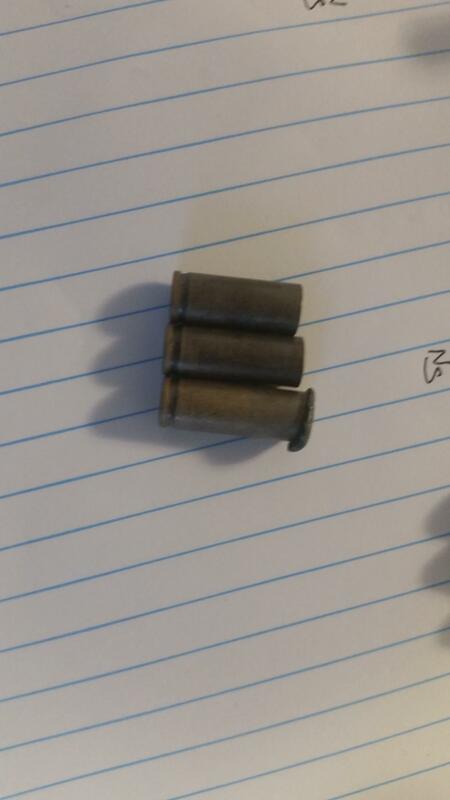 Third pic is a picture of the formed bullets. 1st bullet 180 gr has some room left. It could probably take another 5-10 grains to bring it even to the tip. 2nd bullet 215 gr. It came out perfect. 3rd bullet 242 gr. It has exposed lead. It would probable need -4 thru -10 grains to be at the tip without exposing the lead. The lengths are listed and correspond to the .223 jackets that were formed on the left of the picture that are now missing. Last edited by Time Killer; 02-10-2019 at 06:59 PM. T K ... That is a really good suggestion and will help me speed things up a bit, Thank you. J B ... I hope you get your dies soon, this is almost as fun as shooting. 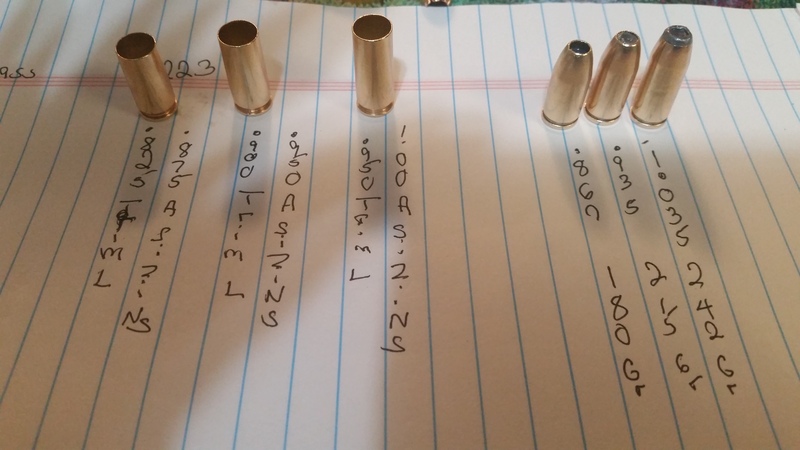 I've experimented with 38 Supercomp brass to make heavy .358 bullets (up to 300gr) for .357 Maximum and .358 SOCOM. It works well. I tried 9mm Magnum brass, but it is a bit too long. What I found was that as the weight became heavier and the bullets slower, it made more sense to powder coat and swage cast lead bullets in the same point form dies I had been swaging jacketed bullets. Here is a 310gr .358 projectile powdercoated in Smoke's powder and swaged in a BT Sniper point form die. OOO! me likeky. I appreciate your discussion of using MT brass for jackets. It makes sense at the prices of commercial jackets. Recycling is cool. At the same time could some of you add a few links to forum topics on this powder coating? It also seems a logical alternative to high costs. I'm also interested in cost comparisons, bore deposit discussion, commercial bulk powder suppliers, any effects on the swaging dies. Pink powder for the ladies?? T K, when I started the idea of building a .357 rimless max. and swaging for it, I was aiming for 158's, since that was my go to round for many years. Now it looks like I can go heavier for the AR as I was looking for commercial pills to experiment with, all I found were limited weights. I don't know if the 158's can chamber right, however when my dies are finished the looks like the options have opened up, especially with the hot core idea.